That’s “engagement”. It isn’t just a concept — engagement is a feeling. A feeling of connection. A feeling of belonging, excitement. Do your members get that feeling? Do they feel that they belong? Do they get excited to attend your meetings and trainings? It's important that they do. The greater your engagement level, the more likely your members will maintain their membership, and refer their friends, which ultimately means a healthy, growing membership base and higher renewal rates for your association. So how do you raise member engagement? How do you get the guy that’s at every meeting, but won’t participate in any roles or utter a word, more engaged? Start here. We’ve compiled a list of some simple ways to attract new members and get your existing members excited, inspired, and involved with the help of association management software. What’s your current membership count? Your renewal rate? You can probably rattle off those numbers quite easily. But what about your engagement score? Many associations grade their engagement level to provide a current reading on their engagement level and pinpoint groups of members that need extra special attention. In the article, To Increase Member Retention, Rate and Score Engagement, the Florida Association of Insurance Agents breaks down its membership into tiers. Tier 1 is the most engaged (8 points or better), tier 2 somewhat engaged (4 to 8 points), and tier 3 the least engaged (less than 4 points). The association then puts effort towards tiers 2 and 3 to increase engagement and involvement with those specific members. Your first step? Run your active membership list using your association management software. Print the list, make copies, then get together with your team. Define what engagement means to your organization. Group members into specific engagement categories and develop an action plan for each member type. Your members believe in your organization and its mission. That’s what attracted them to join in first place. Knowing that, there’s an extremely good chance they’ll back your association’s growth plan without hesitation. Let your members know just how many members your organization is planning to enroll in each membership tier, the renewal rate it seeks, and other goals you’ve set to achieve. Let members know why each goal is important, how it impacts them, what happens if the goals are met, and what happens if the membership goals aren’t met. Make sure you refer to the goals often — not just in one meeting. Repeat your goals in each meeting, and give updates on numbers in emails and newsletters. Frequently communicating your goals ensures those numbers are always top of mind and strengthens members’ involvement and commitment in helping you achieve those goals. Give your members an opportunity to get involved, show their pride, and at the same time, increase your chance of enrolling new members. A “Bring a Friend” meeting is an opportunity to review all the great benefits of belonging to your organization and pique guests’ interest in becoming members themselves. 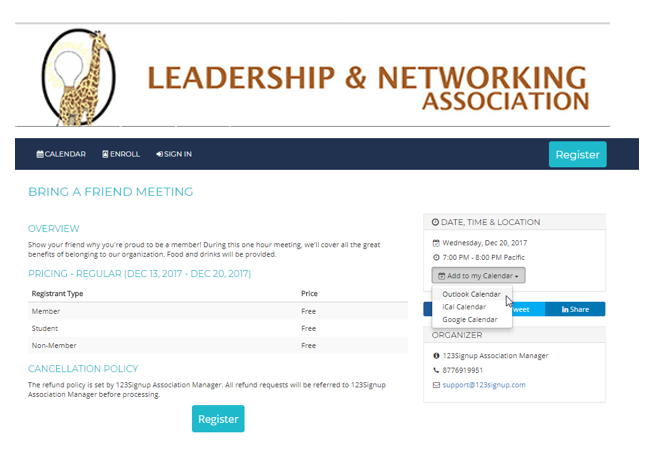 If you use 123Signup association management software, the registration page for your “Bring a Friend” meeting can be created in seconds through the simple event tool. After you’ve set up the event registration, get the word out by sending an email to all members with the registration link. Point out the social sharing buttons on the registration page too, so that members know they can easily share the event on LinkedIn, Facebook, and Twitter. To ensure the event isn't forgotten about, members can easily add the event to their calendar from the event page, as shown in the image below by selecting the “Add to my Calendar” button. If you use 123Signup association management software, links for members to add the event to their calendar also appear in the registration confirmation email. Your members work hard to learn new skills and advance their career. You can provide extra value by giving them the tools to log courses and credits, and track event history. If you use 123Signup association management software, members can view their professional development status at a glance very easily in their member profile. Through 123Signup, you also have the option to develop custom CEU certificates for members to print themselves on demand. Certificates are a great way to acknowledge member achievement and make your members feel valued. Gamification is an effective way to educate your attendees and increase engagement at the same time. You could award points to attendees for attending sessions, for taking and posting a selfie on your social networks during the conference — anything you can think of that will get your attendees involved. Create a leaderboard that you showcase at the conference. The attendee with the highest score wins. Remember it’s best to fill your members in ahead of time to create buzz and excitement. Send an email out to registrants prior to your next meeting or conference to let them know about the game elements being added to your program. Most association management software includes a built-in email communication tool. Through 123Signup, you simply choose your event list directly from the existing database and can get your message out the door with minimal effort. It’s extremely likely that each of your members has a friend or co-worker with mutual interests. Which means it’s almost guaranteed that each of your members has someone — possibly even a handful of people — they would refer to your organization. Why not hold a contest to jumpstart referrals? Many 123Signup clients host referral contests and provide a variety of incentives. Some associations reduce the member’s renewal fee for each referral that successfully becomes a member. Other associations enter the referrer into a raffle for a chance to win a quarterly prize like an iPad, a gift card, or a free membership that they can use for renewal or gift to a friend. Some organizations provide a reward for every successful referral and enter the referrer into a raffle. The rules of your membership-building contest are entirely up to you! It’s best to get the word out initially about your contest by sending an email to all your members. You can easily do that through your association management software and then increase your email frequency as the deadline approaches to build momentum. Make sure that you also continue to drum up excitement throughout the contest period by mentioning the challenge and the results in meetings and ongoing communications, like newsletters. You probably hold several in-person conferences and meetings throughout the year, but what about webinars? Online educational seminars — webinars — are convenient for both you and your participants because no one has to travel to get to the meeting. Another benefit is that the webinar can be recorded, so that those that miss the meeting can watch it on their own time. Plus, you can host the recording on your website and share on social media if you choose. 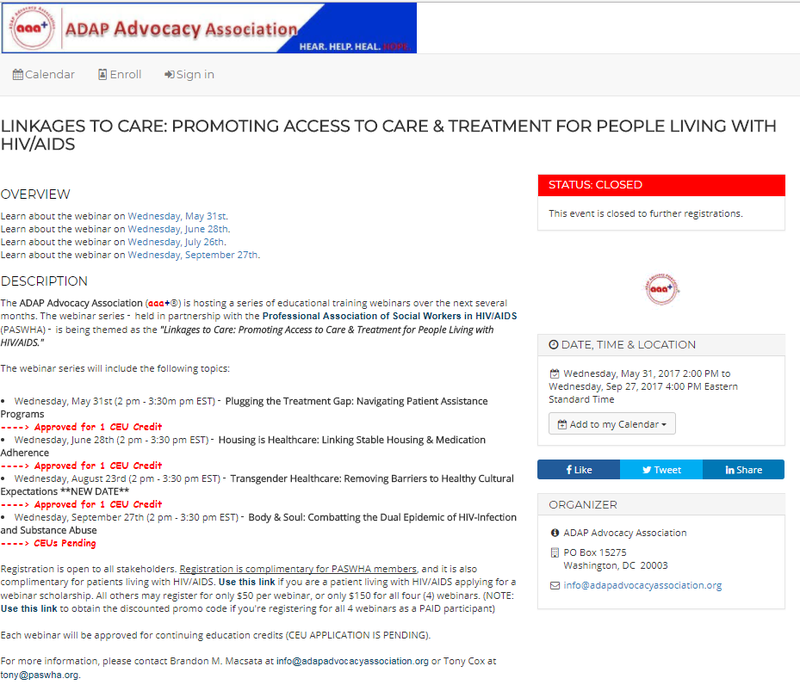 Here’s an example of the ADAP Advocacy Association utilizing 123Signup association management software’s event registration page to promote a webinar series they held May 31, 2017 to Sept. 27, 2017. This event registration page was integrated with their website to provide a seamless online experience to all website visitors. The more connected your members are to one another, the greater their sense of belonging and overall enjoyment as a member. Give your members added exposure and an easy way to connect with one another by providing a member directory. With 123Signup, you can easily provide a searchable member directory that pulls records from the software database. The fewer members you lose, the easier it will be to achieve your annual growth goal. That’s why we always advocate starting your renewal process as early as possible. Many of our clients start as early as three months before expiration. With 123Signup’s automated renewal feature, you can set up as many email templates as you need and schedule them to be sent to expiring members at specific times. It’s a good practice to offer membership levels to appeal to a wider audience. It’s an even better idea to have those membership levels listed on your website and tied to an easy signup or renewal process. 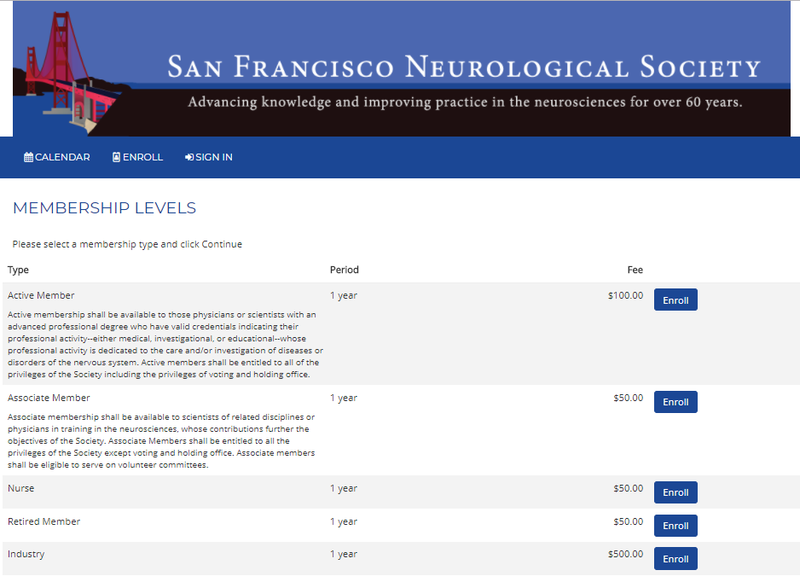 In this example, the San Francisco Neurological Society shows their Active Member, Associate Member, Nurse, Retired Member, and Industry membership types on a 123Signup hosted enrollment page that’s part of their website. If someone is interested in joining, they simply click the enroll button and go through an easy online signup and payment process. It’s worth mentioning here that the 123Signup system is completely configurable to specific business rules. Many of our clients require approval with memberships. The 123Signup system can be configured to accept applications upon approval. Self-check-out at Target. Fueling your car. Placing an online order for pizza delivery. Self-service technology isn’t anything new. In fact, it’s a given in today’s world. People expect it. Enabling self-service tools where your members can enroll online, pay renewal dues online, keep personal contact information up to date online, and signup and pay for an event online provides major convenience for your members — not to mention lowers your association’s overhead admin costs. Through association management software, like 123Signup, you can easily integrate membership and event pages with your organization’s website to take membership enrollments, renewals, donations, membership add-ons like journal subscriptions, event registrations, and payments securely online. Plus, the pages can be formatted to match your brand for a seamless online user experience. Here the International Association of Certified Home Inspectors, New Jersey Chapter uses a 123Signup event listing page to make signing up for its Holiday Meeting easy. The ability to retain existing members and gain new members is essential to your success. But just like you can’t bake a cake without flour, you can’t maintain and grow your organization without the vital ingredient of member engagement. And you can’t create a meaningful, measurable difference in engagement without a recipe to provide direction. Look at your membership. Grade your member engagement level. Then put these tips and others into action to move the member engagement needle forward. 123Signup association management software gives you a host of tools to turn up member engagement. Signup for a free personalized tour today!